Teaching the Geography of Africa? 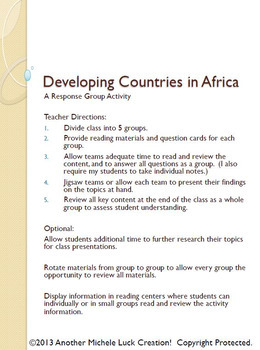 Want your students to investigate developing African countries? Hoping to teach about the impact of Economics on African countries? 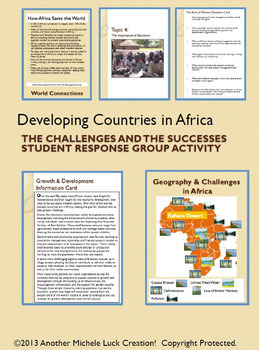 In this response group activity, students learn about the challenges and opportunities for countries of Africa. A number of implementation ideas are provided along with the 23 page set to allow students to investigate 5 topics. All materials are provided and include reading cards for each center, primary sources such as images, charts, and graphs to analyze, and topic questions for the group to investigate. Individual student questions are also provided, and could be used as a wrap up for the activity. 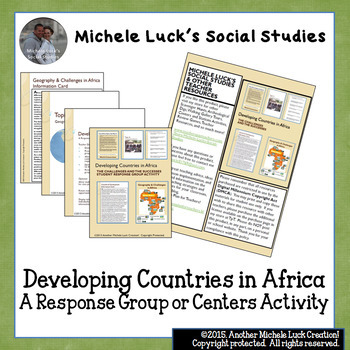 This is also part of my Africa Geography Complete Unit that is available in my TpT Store! 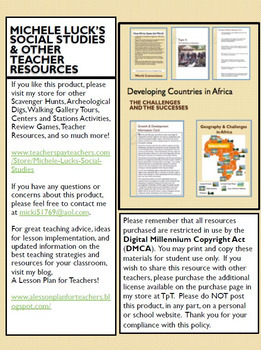 Visit my Store for other great Social Studies Walking Tours, Archeology Digs, Response Group or Centers Activities, Games, Assessments, and so much more!